Les Salons du Multicoque most recently joined brand “Bretagne”, are extremely pleased that the Breton sailing industry has taken a special location at the entrance of the exhibitors’ village. At least five MOD’70 will be available for viewing at the “Cité de la voile Eric Tabarly” (Race For Water, Gitana, Oman, Spindrift, Foncia). Among the largest French and foreign shipyards, we shall point out the world premiere of 3 boats: the NEEL 45 from Eric Bruneel’s shipyard, the Bandit 8.70 from Multid’O shipyard and the Dazcat 11.95 from Multimarine Composites shipyard. Currently, eleven charter companies from around the world have booked their space (Pacific, Atlantic, Indian Oceans, Mediterranean Sea…). Visitors will be able to see these amazing boats and dream of sailing to beautiful destinations on a multihull. A feature of the boat show is the “Multihull club design” area. This area will allow famous architects and designers to display their ideas for tomorrow. 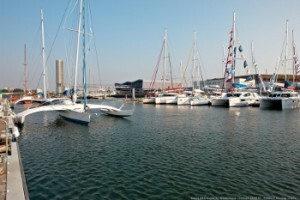 The “Multihull cup” will occur over three days with the finale on April 22nd, 2012. Six Multi 23 (trimarans, designed by the cabinet VPLP), will race. The competitive crews are already set! Entry fee: 6 €, Children under 12 are free.